Maintaining a warm, comfortable environment is a must for families and business’s alike. If your structure runs on a boiler heating system, it’s important to stay current with maintenance and know who to call when a boiler repair becomes necessary. Call or text us at 605.222.4770 or use the request service form below for a fast friendly solution. When it comes to boilers, we don’t discriminate. We address repair and installation issues for units of any size. Whether your needs are residential or commercial, we’ve got you covered with prompt, knowledgeable service. Our priority is getting your system running as smooth and efficiently as possible. A functioning boiler typically warms your property through radiant heating in the form of baseboard vents, cast-iron housings, or infloor tubing. 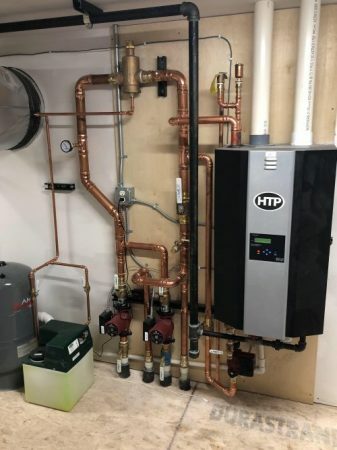 However, some advanced systems allow boilers to go one step further and also heat potable water for domestic use, much like a typical water heater. Our technicians are capable of handling these combination systems, and we’ll answer any question you have to help you decide which method is best for your structure’s needs. Ultimately, if your residential or commercial property isn’t generating heat or providing hot water the way you need it to, we can help you evaluate the issue and devise the right solution. Our installation team is backed with years of practical experience and an intuitive instinct to solve problems the right way. There are numerous factors, both internal and external, that can cause a boiler to fail. A skilled eye knows just what to look for when inspecting your unit so that recommended repairs are accurate. It’s a good idea to make yearly checkups a regular part of your property’s maintenance plan, especially before the winter months arrive. An unexpected boiler malfunction can be a stressful experience, but at Smith Plumbing, we’re always available to assist you when you need urgent service. In instances where you need urgent boiler repair, we’re available to step in with the most effective methods of damage control. With almost 60 years of hands-on experience in plumbing repairs of all kinds, we know how to help. If you’re in need of assistance with your home or building’s boiler system, get in touch today.